RF Parts Company recommends United Parcel Service (UPS). Federal Express is also available for an additional cost. Actual delivery time depends on shipping method. The cost varies greatly with shipping company. Some orders will require custom shipping quote. Please choose the best option for your parcel to be delivered, and if you wish insurance or registration. United Parcel and Federal Express Shipments: Usually ships same or next business day. NOTE: Additional time may be required if incomplete information is provided by customer. Priority Mail: Usually ships same or next business day. Flat rate boxes will be used where applicable. UPS and FedEx process their claims immediately, with rapid resolution. Postal claims may take up to 3 months to be resolved. Please keep in mind the customer owns the package as soon as it leaves our dock, and we have no control or responsibility over the shipping while in transit. RF PARTS COMPANY DOES NOT SHIP FREIGHT COLLECT ON CUSTOMER ACCOUNTS, WE PREPAY AND ADD TO INVOICE. ("DW") charges may apply to any package and/or shipping method. UPS and FEDEX measure every box for size to weight ratio. Light weight items that go in larger boxes will get billed at the dimensional weight of shipping box. The dimensional factor for all box sizes are divided by 139 for Domestic and International shipments. (Example: 10 x 10 x 10 ÷ 139 = 7.19 pounds). Check with Sales Representative if this will apply to your order. A Delivery Area Surcharge or Extended Area Surcharge applies to each package UPS and FEDEX delivers to certain zip codes. Go to www.ups.com or www.fedex.com for a listing of all applicable zip codes. UPS charge of $4.00 per package delivered to a commercial destination, and $4.45 per package delivered to a residential destination. Standard Rates apply, No C.O.D. Residents add appropriate sales tax. 7.25% State-wide, 7.75% San Diego County. With the advent of 911 emergency systems, nearly all RFD addresses were converted to street numbers and names. If you don't give us your assigned "911" street address, UPS will charge an additional $15.90 fee. For International Shipments: Availability of ship methods is dependent on the destination country. Except as otherwise provided on the Site, (1) the shipping costs will be prepaid and added to your order, and (2) all import licenses, duties, tariffs, taxes and brokerage fees will be your responsibility. There is $35.00 Wire Transfer fee. Products are not sold for evaluation. Under some circumstances (at the discretion of RF Parts Company) and with its prior approval, we will accept an item for return. * Please be advised of “limited warranty” allowed to such items. (If you are not sure, ask a Sales Associate for details.) Should you suspect product received was damaged; please see the information below under “Damaged Items”. 1. Call our Customer Service Department at (760)744-0700, Ext 310 for a Return Authorization Number. Hours are 7:30 a.m. - 3:30 p.m. PST. Items returned without Return Authorization on outside of box will get rejected when they arrive. Box must have RMA number on outside of box when returning. Since the vendor, RF Parts Company does not control the use of its products, there are no express warranties which extend beyond the description on the face hereof. SELLER DISCLAIMS ANY IMPLIED WARRANTIES OF MERCHANTABILITY OR OF FITNESS FOR ANY PARTICULAR PURPOSE. Since Seller cannot control the manner of use of its products after their sale, Seller will not be responsible for any consequential or indirect damages. Concerning products for which Seller is acting as only a distributor of products manufactured by other companies, Seller expressly limits its liabilities to any guarantees extended by the manufacturer, which guarantees Seller will pass through to the customer. Further, Seller will, at its option, either replace the goods sold or refund the purchase price. No warranties will apply if the goods are in any way altered or modified after delivery by Seller. See additional information regarding warranty of semiconductors and vacuum tubes. Receiving and Special Purpose Tubes carry a 30-day limited warranty on material and workmanship. However, TV SWEEP TYPE receiving tubes are not designed, rated, guaranteed or warranted by the manufacturer or RF Parts Company, for use in linear amplifiers. Please be sure the tubes you received are correct for your equipment. We do not warranty or guarantee suitability or reliability of any sweep tube used as an RF amplifier. 6146B and 6146W carry a one year limited transmitter tube warranty, and 6JB6 and 6JS6C carry a 90 day limited warranty when used in transceivers. RF Parts Company inspects all tubes before shipment to assure quality. Tubes returned for possible warranty are subject to our failure analysis to determine if claim can be covered by the factory's limited warranty. Tubes which, in our opinion, show evidence of excessive dissipation, low emissions, wear, or other damage indicating improper operation or excessive use, will likely not be accepted for warranty or exchange. Any tube not accepted for warranty or exchange will not be returned unless requested by customer who shall pay shipping charged to return same. The Limited Warranty period begins at receipt of tubes. New Eimac, Taylor, RFP (RF Parts Company) and similar power grid transmitting tubes carry the manufacturer's limited warranty against defective material and workmanship. Eimac, Cetron & Amperex glass tubes have a lesser warranty, ask your salesman. The Limited Warranty period begins at receipt of tubes. RFP and Taylor 3-500ZG carries a 2 year, limited warranty. (First year 100%, 2nd year prorated). The Taylor 811A & 572B carry 1 year limited warranty. 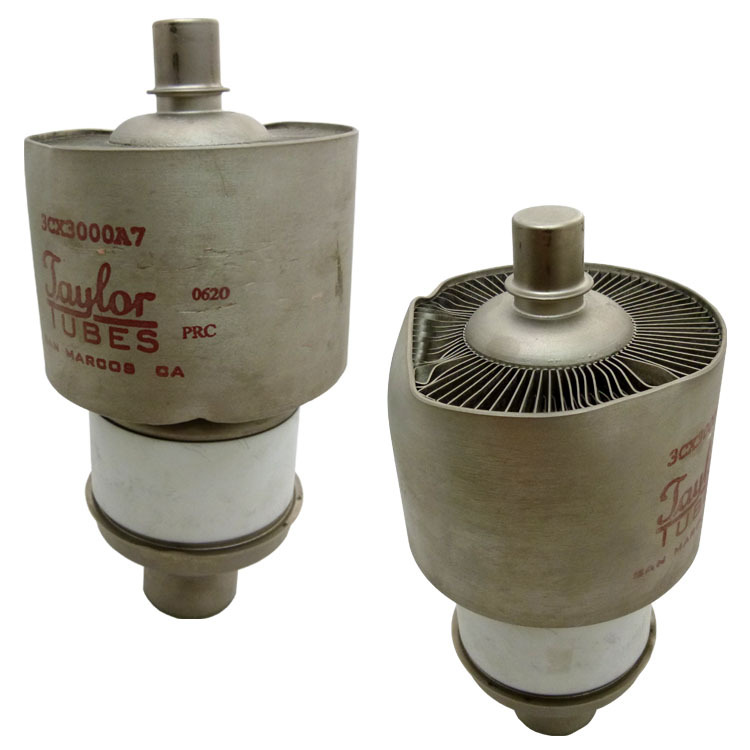 The Taylor 833A/C and 4-400C have a 1 year prorated Limited Transmitter tube warranty. all tubes / product returned will be retested and inspected for proper usage. RF PARTS COMPANY does have the right to repair, replace or deny any returned product at our discretion. Any tube product returned, which we feel is in good working order may not necessarily be replaced, but rather will be RETESTED and CONFIRMED to be in good working order and returned to customer as is. NOTE: warranty “replacement” parts (when “Matched Parts” are sold) are usually always matched up (whenever possible) to the “original” product, in order to conform to our matching guidelines. If a product fails during the first 10% of the operational hours due to faulty workmanship or material, it will be replaced or credited at 100% of original purchase price. If failure occurs during the remaining 90% of the warranty hours, a prorated adjustment will be calculated, and a credit will be issued towards the price of a new tube. Please contact Customer Service for warranty claim. Products are not sold for evaluation. Under some circumstances (at the discretion of RF Parts) and with its prior approval, we will accept an item for return. * Please be advised of “limited warranty” allowed to such items. (If you are not sure, ask a Sales Associate for details.) Should you suspect product received was damaged; please see the information below under “Damaged Items”. RF Parts Company has made it simple to find the parts you need! Simply click the category your part falls under and you can filter through the sub categories on the left hand side till you find the specific category you are looking for. Do you know the part number you're looking for? Use the search tool near the top. You will notice it by the words, 'search entire store here' in a rectangular box. Enter the item you are looking for and hit 'Enter' or click on the 'GO' button next to the box. If you do not find the item, you can limit the characters and hit search again and you may get more choices to find your item. You can narrow your search by using the "Sort by" clickable: Price, Name, Position, or Made in the USA. As you're browsing through our site and you see a product that interests you, click on the picture or name of the product to see more details about that product. The resulting page provides you with a larger picture, alternate pictures and a product description. Just below the product price you will see your 'Add to Cart' options. If applicable, designate how many you would like to purchase in the 'Quantity' box and then click 'Add to Cart'. 3. Start the check-out process - it's easy! The next screen you will see will ask you if you've registered your information with us before. If you have, simply complete the small form on the right-hand side and click 'Log-in' so we can pickup your previous shipping and billing addresses to make check-out faster. If you haven't, or do not wish us to keep your information on file you can skip this step and there will be a 'checkout as guest' feature and we will not save your personal information. Scroll down and enter your appropriate billing and shipping information. For new customers, enter a login and password so you can access the status of your order at a future date. Be sure to select a shipping option at the bottom-right. When you are finished entering this information, click 'Continue Check-Out' at the bottom-right. - Credit Card: Visa and MasterCard for Domestic customers only. (AMEX or Discover customers can choose PayPal as payment option and use card through PayPal). *INTERNATIONAL CUSTOMERS* We are no longer accepting Credit Card payments if you are located outside of the United States. Our preferred method of payment is by International Wire Transfer. At this time, however, you may use PayPal. If you are having issues with your PayPal payment, please send your payment to our RFP PayPal account, at order@rfparts.biz. Your order shall be processed immediately. We appreciate your business! - PayPal. You will automatically be redirected to the PayPal website upon completion of order to submit your payment. Orders will not ship until we have verified payment has been sent. If after 30 days payment has not been sent your order will automatically be cancelled. PayPal will accept Visa, MasterCard, Discover, and American Express as payment option. - Purchase Order: This option is for NET Terms customers only, if you use this option without pre authorization your order will immediately be cancelled. - Wire Transfer: Please Call or email our Sales Department for instructions on how to use this option. $35.00 Wire Transfer fee will be added for all International Transactions. - Money Order: Please Call or email our Sales Department for instructions on how to use this option. On the final screen, enter your credit card information complete with number (no dashes or spaces), expiration and security code and then click 'Place Order' - CLICK THIS BUTTON ONLY ONCE. After you successfully enter your credit card information, you will be presented with your purchase receipt. Be sure to print this screen for your records. Upon placing an order on our site, our system will immediately 'authorize' your credit card for the purchase amount. This authorization is how our shopping system 'knows' to approve your purchase and provide you with an invoice. While some credit card statements will show this as a charge right away, this authorization is not an actual charge. Once we verify product availability and your transaction is approved by our fraud department, we will prepare your order for shipping and charge your credit card at that time. No credit card will be charged before product is shipped. If somehow we cannot fulfill your order, your authorization amount will be voided and released from our system within 48 hours.